Cut five long table slats (J) from 1x4 treated lumber, each 56-1/2 inches long. Refer to Figure 4 to guide your placement of the table slats. Glue and nail one long table slat (I) into the outermost position across the front of the frame so that it overhangs the frame by 1 inch on the front and on each side. 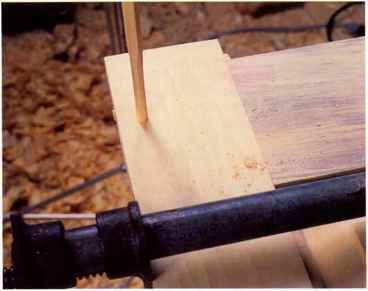 Drive two 3-penny finishing nails through the long table slat (J) into the short side (B), and two nails through the long table slat (J) into each of the long sides (A). Glue and nail three more long table slats (J) to the frame, placing the nails as you did in step 2. Position each new slat directly next to the previously attached one, and make sure that all of the ends are even. Place (do not glue or nail) the remaining long table slat (J) in the innermost position, next to the four attached slats. Use a pencil to mark the bottom of the slat where it overhangs the frame (refer to Figure 4). Cut off the portion of the long table slat (J) that overhangs the frame. The slats need to be flush with the frame so that the surround will stand right up next to your grill. Replace the long table slat (I), and glue and nail it to the frame in the same manner that you used for the four previous slats. Cut five short table slats (K) from 1x4 treated lumber, each 18 inches long. Attach four of the short table slats (K) to the frame over the two long sides (A). 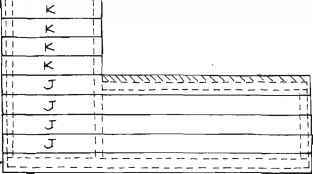 The short table slats (K) should be flush with the inner long side (A), and overhang the outer long side (A) by 1 inch, as shown in Figure 4. Use glue and drive two 3-penny finishing nails through each short table slat (K) into each of the long sides (A). Place (do not glue or nail) the last short table slat (K) behind the four previously attached slats. Use a pencil to mark the bottom of the short table slat (K) where it overhangs the frame (refer to Figure 4). Because I wanted to be able to put my surround (and grill) up against a wall, I cut off the entire portion of the short table slat (K) that overhangs the frame. If you wish, you can cut the short table slat (K) so that it overextends by 1 inch to match the overhang on the front and sides. Replace the short table slat (K),and attach it to the frame with glue and finishing nails just as you did for the four previous slats.